Begin with the family motto of “we’re all in this together!” Start with a family meeting to talk about what this means. Keep it simple but think through all the responsibilities at home and create a list of the options. There are lunches and dinner to make, groceries to buy, laundry to do, lawns to mow, toilets to clean and more. So getting a list together that hits on the most important tasks is a starting point. Here is where we start being creative! · Works from family members’ strengths. Who is great at what? Give your family jobs they do well rather than struggle with. · Give the chores different point values by “difficulty” of completion. Bathroom and toilet 3 points, kitchen clean up 2, dusting 1. · Create partnerships to complete the chores, such as mom/sister make the dinner, dad/other daughter do the dishes. It is always more fun with a partner. · Set a time everyone does the same task. Set the kitchen timer, turn on the high energy music, or sing the clean up song. · Set a standard of completion everyone agrees on. What does it mean to have the dishes “done” or the laundry “complete”? Set a time frame for completion. Emptying a dishwasher after the dishes are piled in the sink defeats the purpose. · Put aside your perfectionism. Encourage your family to do their best job, even if it is not to your standards, the manner in which you would do it or at the speed you would do it. · Affirm each family member’s contribution each week. Praise goes a long way in getting things done. · Create a chores chart and post it in a common space. It is the chart that reminds the family, rather than the parents. · Incentivize your family’s work. Incentives can be whatever works for you, but the simpler the better. · Use this method for every day responsibilities and upcoming family events, including holidays, birthdays and special occasions. · Make it fun! Everyone wants to work together when the atmosphere is relaxed and happy. Great resources are available on www.familymanager.com including lists, charts and more! How does team work happen in your family? Have you had a life long struggle with being organized? Need support from a community of people who are equally overwhelmed? Don’t know where to start? Looking for accountability and resources to help you live the life that truly want in live? Need an affordable organizing solution? 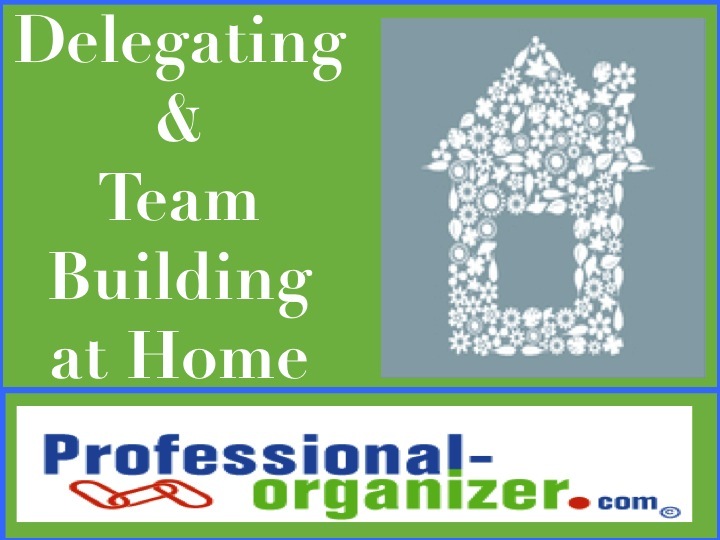 Professional-Organizer.com’s Clutter Support Group is a six week, 1 ½ hour program where members support each other in their organizing journey. It begins on March 2 and ends on April 6 and the fee for membership is $120. In our weekly meetings we will discuss organizing strengths and decluttering techniques. Starting the third session, we will begin reading and discussing Making Peace With Things in Your Life by Cindy Glovinsky. Each member will have a small project they are working on for the duration of the group. · Learn organizing strategies for your home or workplace. · Collaborate with group members to create systems and routines and work for you. · Champion others and be affirmed in their and your quest for organization. For more information or to join the group contact Ellen at edelap@professional-organizer.com. Enrollment is limited so contact Ellen today! Thanks Allison for this amazing step by step way to organize your office! Step by step directions for getting your office under control. Happy organizing! Strategic productivity is “doing what you do best and delegate the rest.” There are so many reasons why people don’t delegate! 3. Not organized enough to take the time to figure out what needs to be done until right on top of the deadline. Once you successfully delegate you will not want to do the task again. You will be empowered by the team work you are a part of, you will be more successful at what you do, and your income will increase most importantly! How do you get started delegating? Delegate whole pieces or entire job pieces or simply tasks and activities. Clearly define what outcome is needed, then let individuals use some creative thinking of their own as to how to get to that outcome. Clear standards of performance will help the person know when he or she is doing exactly what is expected. Successful delegating requires a change of your mindset. Begin by building delegating into all of your plans. Start breaking down administrative, marketing and other tasks into lists and specifically identify whether you or an assistant will handle a particular matter.